Probably one of the most ground breaking piece of functionality in this release is also its most non-descript : the change of behaviour of STET() an CONTINUE() rule functions. These two functions now have “meta” capabilities: the results of these functions can be further processed. For years as a consultant, I have struggled sometimes with the need to test the value of the current cell being calculated. In the past it called for inelegant solutions of testing the value of a “entry” cell to calculate the “calc” cell. 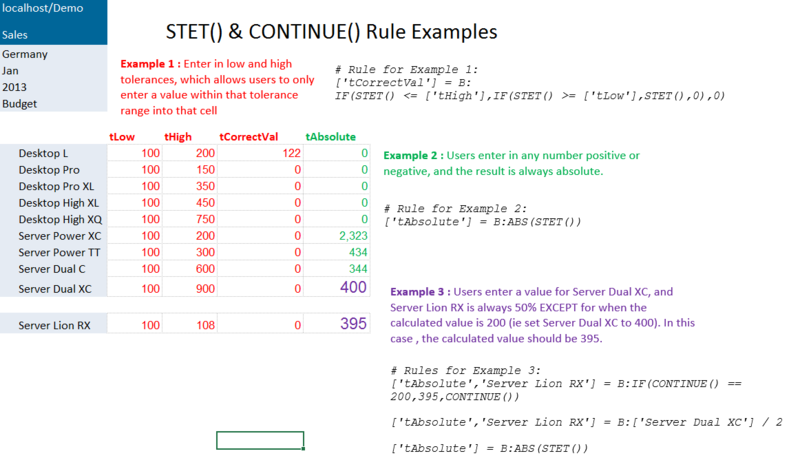 Now you can do this in one step and add serious power and simplicity to your rules and your model. Order is important in this example, so ensure that you copy these exactly. Once the rules are in, you should be able to recalculate the spreadsheet, and play with entering values to see the results. Make no mistake this change puts Jedox ahead of rule engines in other competing in-memory technologies. A unique capability which certainly makes (consulting) life easier….